Microsoft has just received a patent for an interesting feature in squad based co-op shooters. US Patent #7559834 was filed back in 2002, but only just got approved by the United States Patent Office. From the description, timing and pictures - it appears to be for the 4 player co-op game Brute Force from the original Xbox. The patent is very specific to drop-in and drop-out play local to a console, and more specifically, it describes a feature we really haven't seen much in co-op play. Dynamic split screen creation, like that in the recent Resident Evil 5 allows a player to join at any time having the game create two sets of player views. I'd think RE5 wouldn't fall under this patent because the game is not a squad based game. Other details in the patent include the ability to switch between squad members on the fly, AI controlled squad mates when not in player control, and hardware details of how it functions. 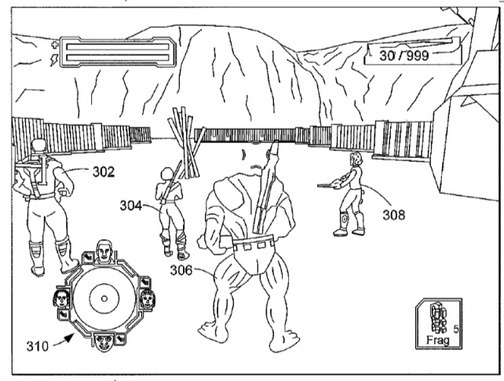 There doesn't appear to be any mention of online play in the patent. Hopefully something like this doesn't have a negative affect on other developers trying to implement a similar feature. As we mentioned earlier, I can only think of one title other than Brute Force that implemented this method of split screen drop-in/drop-out co-op play. What are your thoughts on algorithmic solutions and gameplay methods being patentable?